Ambassador Amina Mohamed, an international civil servant and the current Kenyan minister for education, science, technology and innovation, is this year’s recipient of the African Woman of Excellence award. 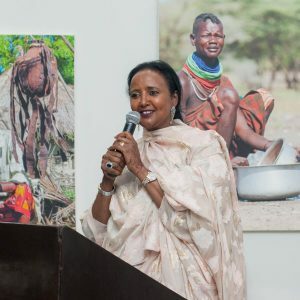 This year, the African Union and the Diaspora African forum are honouring the first woman minister for education in Kenya for her long and outstanding work in girls’ education and governance. This year’s theme pays tribute to the first iconic recipient of the AWEA Committee’s Living Legends Award Winnie Madikizela Mandela.”Girls fail to acquire an education because of violence, which includes kidnapping, maiming as well as sexual abuse, exploitation and bullying. Statistics indicate that less than five percent of girls in rural-conflict settings in Africa complete secondary education.” — Ambassador Amina Mohamed, Kenya’s minister for education, science, technology and innovation. Previously, Mohamed served as the minister for foreign affairs and international trade, deputy executive director of the United Nations Environment Programme and permanent secretary in the ministry of justice, national cohesion and constitutional affairs where she played a key role in creating the 2010 Constitution in Kenya. Most recently, she has worked tirelessly in the arenas of women’s empowerment and girls’ education in Kenya and around the world, especially as co-chair of the Commonwealth High Level Platform for Girls’ Education which works to put 130 million out of school girls back in the classroom. I grew up in a society where existing norms defined a lesser role and position for women—a notion I was uncomfortable with from an early age having been brought up by a strong mother. I therefore made a conscious and deliberate decision to cultivate my own success in the knowledge that great careers are not hereditary; they must be seeded, grown and nurtured. IPS: Would you say that the millions of girls who don’t go to school is a global crisis? What have been some of the challenges you have faced or seen working towards girls’ access to education, and what has Kenya done differently to address this issue? AM: It certainly is a global crisis. The Global Education Monitoring Report, 2018 indicates that only 66 percent of countries have achieved gender parity in primary education, 45 percent in lower secondary and only 25 percent in upper secondary. Other statistics are more frightening—UNESCO [U.N. Educational, Scientific and Cultural Organisation] estimates that 130 million girls aged between six and 17 are out of school. An additional five million girls of primary-school age will never enter a classroom. Among the critical challenges that impede girls’ education are poverty, conflict and violence, early marriages, harmful traditional practices, long distances to school, and inadequate menstrual hygiene. Despite this recognition, humanitarian aid for education remains very low—catering, by 2015 estimates, for only two percent of requirements. To overcome this challenge, a possible way forward is for humanitarian agencies and development actors to come together and set up a specialised funding stream that meets the other 98 percent of the requirements for education in conflict situations.